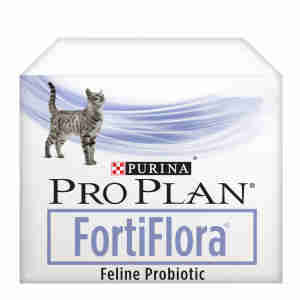 PURINA PROPLAN VETERINARY DIETS Feline FortiFlora Probiotic Complement helps ensure your cat's immune system remains healthy. This products also helps manage digestive upsets. Ingredients: Meat and Animal Derivatives, Minerals. Nutrition: Analytical Constituents, Protein: 55%, Fat content: 19%, Crude ash: 9.5%, Crude fibres: 1%, Additives: Nutritional Additives mg/kg: Taurine: 2 480, Fe: 1 070, I: 17, Cu: 265, Mn: 275, Zn: 2 260, Se: 1.57. Sprinkle 1 sachet daily over your cat's regular food. Improvements in signs of digestive upset may be seen within a few days but to see the maximum effect use one sachet daily. Water should always be available. This dietary addition to their food has helped my young kittens to digest their food, and assists when they get runny poos. All my cats love it, and wait to have it sprinkled on their food. This seems to help my cats digestion, and they love it! Bought this because my cat doesn't like the new food I'm switching him to - I read that FortiFlora makes food more palatable, and it does. Will slowly reduce how much I add and hopefully he'll eventually eat it as is! Wish it came in a tub with a scoop, that'd make reducing the amount a lot easier tbh. I bought this product as my cat had been suffering on and off from boughts of what seemed like stomach ache and sensitivity to certain richer brand cat food . I then realised he had had a course of antibiotics which then made me think he may need this product . It has definitely helped him and he seems to like the taste too!